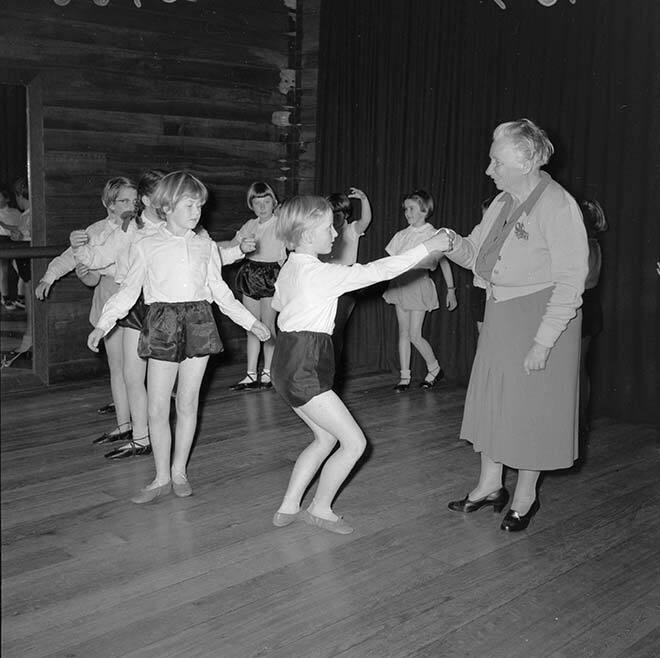 Estelle Beere, shown teaching dance in her studio in Thorndon, Wellington, in 1957, has been identified as New Zealand's first professional ballet dancer. After studying with Joseph Lowe (one of a family that taught dance for several generations), Beere went to England, where she was taught by Alexandre Genée (uncle of Danish dancer Adeline Genée). The Ballets Russes style he taught was brought back to New Zealand when Beere returned in 1897 to set up her own dance school in Wellington. Among her students was Thurza Rogers, who would go on to join Anna Pavlova's company. New Zealand ballet teachers were usually generalists, who taught not just ballet but several forms of dance – ballroom, tap, flamenco or Scottish dance were all likely to be offered alongside ballet. Many teachers had been professional dancers, appearing in musicals and light operas put on by the J. C. Williamson chain of theatres.